The Glastonbury Festival generated more than £73m last year, according to the first report into the economics of the world-famous event. 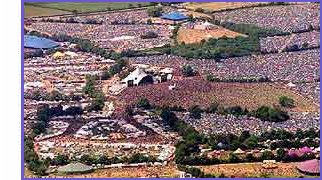 About 177,500 people attended the festival at Pilton Farm in Somerset. The average festival-goer splashed out £293.24, excluding the ticket price but including transport, the independent study suggested. Organisers spent almost £2.5m on paying performers, which last year included Bjork and The Arctic Monkeys. The total outlay by Glastonbury Festivals - the firm behind the event - totalled £21.2m. Besides the acts, this spending ranged from staffing and security to infrastructure and wages. Meanwhile festival-goers spent a total of £52.1m. As with some previous festivals, the event was blighted by heavy rain and mud. And the report said that the adverse weather meant that spending at the festival was not viewed as "typical". More money was spent on food and drinks than usual while spending on non-food items - with the exception of waterproofs and wellies - was less than expected. On-site spending averaged £144.11 per person, while off the site an average of £149.13 was spent on items such as transport, accommodation, and food and drink in pubs and restaurants. A survey of festival-goers found that almost half (46.8%) came from London and the south east with about a quarter (23.3%) from the South West. It also found that 64% of attendees travelled by private car while 33% used public transport. The report, commissioned by Mendip District Council and the festival organisers, also collected information from local businesses. It found that 44% of firms - including 39% of enterprises in the town of Glastonbury itself - saw turnover decline during the festival period. Firms which did not sell food and drink were hardest hit, while those who saw an upturn in trade included pubs, restaurants, a marquee supplier and a scaffolding firm. Council leader Harvey Siggs said the report had generated some "valuable information". "We've always recognised that Glastonbury Festival is an important event for our district and the country, but have never been able to judge just how important it is," Mr Siggs said. "This information will enable us to better understand how it affects our local economy, which is so important to many aspects of our lives and business, and has shown us in detail how large scale events impact on our local area." Tickets for the 2007 event sold out in about two hours. But enthusiasm for this year's festival appears to have dampened with thousands of tickets remaining, almost a week after they went on sale.